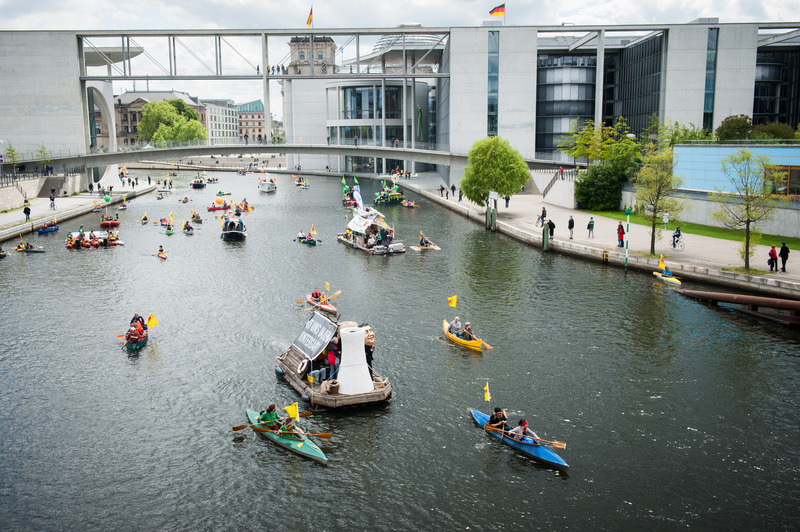 Complaints about the high costs of the Energiewende are misguided. The primary reason German users pay high electricity prices is not the government’s support scheme for renewable energy. It is rather the fact that energy suppliers are not passing on to consumers the large drop in wholesale prices that results from the rapidly expanding wind and solar generation capacity. This is evident from an analysis of German prices. A similar situation exists in many other European countries. Unfortunately the latest Energiewende reforms initiated by the German government do not address this problem. Over the last 3 years we have been hearing a never-ending flow of complaints from German electricity consumers about the high retail prices brought about by the increasing share of renewables in the electricity mix (25% today). 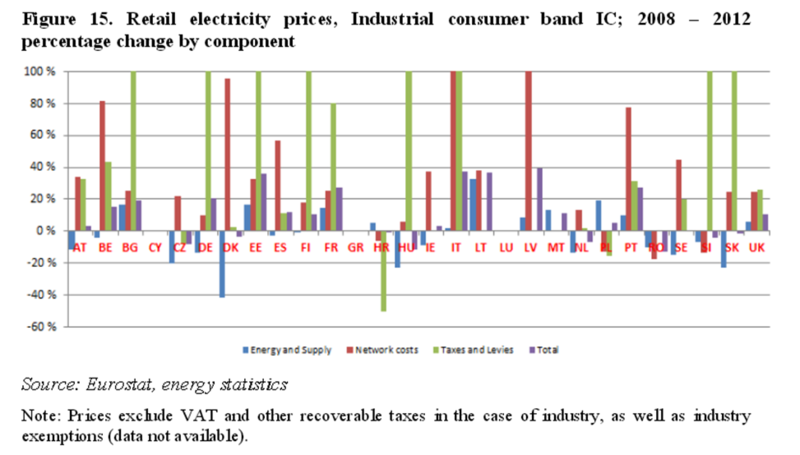 It is not just households and small- and medium-sized businesses who complain, but also, perhaps more surprisingly, big industrial consumers, who are largely exempted from paying the renewables surcharge on electricity, the famous Umlage (although they are faced with relatively high gas prices compared to the US). The Umlage today amounts to 6.24 eurocents/kWh. In response to these complaints the Minister of Economy and Energy, Sigmar Gabriel, announced on 3 March a reform of the Renewable Energy Law (Erneuerbare Energien Gesetz, or EEG). The two most prominent measures are the gradual reduction of the financial support for renewable energy generators ̶ from 17 to 12 cent/kWh ̶ and the preservation, by and large, of the principle of surcharge-exemption for big industries, in the name of competitiveness. Although the former measure may be justified, considering the increasing maturity and cost competitiveness of renewable technologies, the latter is based on an erroneous perception of the German market’s reality. The government’s support scheme for renewables is not the primary reason why German prices have been pushed up for households and non-exempted industries,. The real issue is that energy suppliers are not passing on to the end-users the considerable drop in wholesale prices that directly results from the rapidly expanding wind and solar generation capacity. In other words, suppliers are in effect keeping prices artificially high. To understand why this is so, we have to take a look at the particular features of the energy price system in Germany. The German electricity market currently features some of the lowest wholesale prices in Europe, along with Poland and the Czech Republic. According to the Berlin-based think-tank Agora Energiewende, the “average German spot price in 2013 (37.8 Euro/MWh) was 14.2 Euro/MWh lower than the Dutch spot price (52 Euro/MWh) and 5.5 Euro/MWh lower than the French one”. It has moreover been steadily decreasing over the last few years – a fall by more than 25%, since 2011. It is now converging with some US regional prices, notably in the North-Eastern region, where the average peak-hour price stood at 54.5 Euro/MWh for the first half of 2013. The US upward trend is unlikely to change in the foreseeable future. Nor is the German downward spiral. The price fall on German markets is mainly due to the large-scale replacement of gas-fired power plants by cheaper coal-fired ones – a 23.1 TWh surge since 2010 – as well as to the additional 46.9 TWh of renewable generation capacity – with very low marginal production costs – that have long since compensated the generation capacity loss in the aftermath of the 2011 post-Fukushima nuclear shut-down. A quick look at the well-known German energy objectives, i.e. achieving a 55 to 60% share of renewables in the electricity mix by 2035, makes it clear that the price curve on German wholesale markets will not reverse its course any time soon. So, increasing power generation costs are not to blame for the current threat to German industrial competitiveness. Are high end-user prices caused then by taxes and “green” levies imposed by the government? That would seem to be the obvious conclusion. But is it true? It cannot be denied that taxes and levies have increased in Germany, namely by 46% for domestic and 230% for industrial consumers between 2008 and 2012. These figures are notably higher than the EU averages, which stand at 36.5% for households and 127% for industries. And yet this seemingly obvious explanation misses the real elephant in the room. The electricity bill paid by end-users comprises three components. First, the energy and supply component reflects the generators’ expense for the delivery of power to the grid (“wholesale element”) and the costs of the sale of power to the final consumer. Second, the network costs represent the maintenance and expansion of the transmission and distribution networks as well as the operator’s service. The last component reflects the government-imposed tax and levies. True, German electricity consumers – or at least those who did not benefit from exemptions – faced one of the sharpest increases of the “tax and levies” component EU-wide, as highlighted above. But what has not sufficiently been pointed out in the German debate is that this sharp increase should have been offset by a significant diminution of the “energy and supply” component, to reflect the fall in wholesale prices. According to my calculation, if the fall of 13.2 Euro/MWh between 2011 and 2013 had been passed on to the end-consumers, it would have covered 44% of the tax increase! Thus the tax burden paid by the average German end-consumers could have been significantly mitigated. It seems, then, that what is happening in Germany is that energy suppliers are profiting from the growing discrepancy between wholesale and retail markets. How did this happen? In the words of the European Commission, “the relationship between wholesale and retail prices can be cut by high levels of market concentration”. Now critical readers will say that this can’t be the case in Germany, as the German retail market is not highly concentrated. There are four main electricity suppliers (E.ON, RWE, EnBW and Vattenfall Europe) who together cover only around 40% of the power distribution market. However, the German market has another interesting feature. It is characterised by local suppliers (Stadtwerke) that are still largely dominant at the regional level. There is the real reason for high prices: lack of competition. The focus of a reform of the EEG should therefore be to foster competition at the retail level, rather than to maintain unfair exemptions. More competition would lead to lower wholesale prices getting passed on to consumers. In addition, lowering exemptions from 160 to 117 TWh annually would moreover remove another 20% of the current Umlage, according to Berlin-based Agora Energiewende. Such an ambitious reform would make all the more sense as big firms are the only ones that have been passed on part of the wholesale price decrease so far: the “energy and supply” component for industrial consumers decreased by 6.4% between 2011 and 2013. Additionally, big industrial players usually buy their power directly on the wholesale market, thereby benefiting directly from the Energiewende-induced lower generation costs. Many of them also produce their own power (25% of Germany’s industrial power consumption) – from cheap coal. The situation we have described is not confined to Germany. In fact, most electricity markets in the EU are facing a situation that is comparable to Germany’s, although sometimes for different reasons. The latest price study released by the European Commission shows that EU wholesale electricity prices, much like Germany’s, have fallen by 35-40% on average since 2008 and have been hovering between 40 and 60 Euro/MWh since then. This is to be compared to current US prices ranging between 27 and 50 Euro/MWh. The gap, albeit significant, is diminishing and, just like on the German market, this trend is unlikely to change as the European commission links falling prices to “the increase in competition following market coupling, the unbundling of electricity generation from system operation, the fall in EU ETS carbon prices and the growth of power generation capacity with low operating costs (such as wind and solar power, in addition to existing nuclear and hydro power)”. Apart from ETS carbon prices, which hopefully will soon increase, the other factors all result from pro-active and quite successful EU policies in the field of market opening, competition and sustainable development. All of them will be pursued in the years to come. There is therefore no end to the wholesale price decrease in sight, neither in the EU nor in Germany. 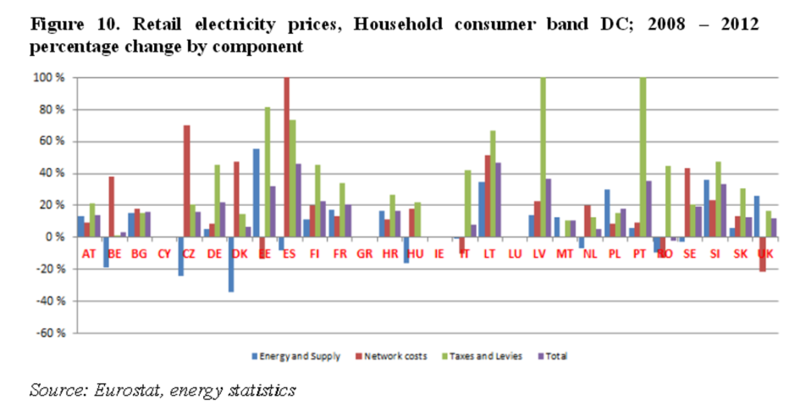 The following chart blatantly shows that the “energy and supply” component of the electricity retail price in no single EU member state has fallen by anywhere near the 35-40% mentioned above (except maybe for Denmark). In fact this component has even significantly risen in some countries – notably France, Lithuania, the UK or Slovenia. EU industries, like Germany’s, have also suffered less than households, as reveals this second chart. So, Germany is far from being an isolated case. Now, being the biggest energy market in Europe and frontrunner in the energy transition, Germany’s energy policy is closely observed by all its EU partners. If what is ailing the German market is also to a large extent ailing other EU markets – as is the case – then wrong decisions there are likely to cross borders and set the tone elsewhere, first and foremost in Brussels. As a matter of fact, they already are: the new guidelines on State aid for environmental protection and energy released by the European Commission in April 2014 provide legal room for large-scale exemptions, thereby largely reflecting German views. In other words, lack of price competition in the distribution markets, not taxation, is the primary cause of rising prices in Germany and in the entire EU. In fact, the lack of competition among electricity retailers is not only hampering the smooth functioning of electricity markets but also indirectly – and that is fundamental – creating massive competition distortions between EU industries. The German exemptions, failing to address the roots of the problem, are angering other EU member states instead. They lead to mutual distrust, increasing hidden subsidies and wasteful legal procedures before the Commission’s competition authority. It can hardly be a good omen for the completion of the single market. Legally forcing energy suppliers to pass on price decreases would imply difficult and time-consuming legal arm-wrestling against powerful firms and might sound like governments are interfering with prices – enough to put any Commission official in a cold sweat. This solution might nevertheless end up being the only possible one, as competition has not borne fruit despite most EU electricity markets having been liberalized. Yet there is another solution. Customers could also take the matter into their own hands. They have been far too passive up to now. The switching rate (i.e. the number of consumers who effectively shift from their traditional power supplier to a new one that offers better prices) is the heart of successful competition in liberalized power markets and it remains depressingly low in the EU– around 4-5% on average in 2011. Its increase would put the necessary pressure on electricity suppliers – notably Stadtwerke in the German context. So, if we are to fast-track change and avoid cumbersome and endless legal proceedings between competition authorities and firms, our behaviour as customers must change. It is upon this rock that competition will be built. Stronger governmental policies aimed at publicizing the importance of switching to a lower-price supplier would certainly be useful. But ultimately it falls also upon us to bring about the price relief we deserve. After all, haven’t we been paying all along for more windmills and solar panels, the marginal costs of which are nil? Gabriel Camus (gabrielcamus@hotmail.com) is an independent energy consultant and free-lance journalist based in Paris. Figures calculated on the basis of Eurostat data. They apply to the range DC of households and IC of industries. Whilst the marginal costs of solar panels and windmills may be low (not ‘nil’) this ignores the fact that much of this capacity is still debt financed. Surely it makes sense to maintain a steady retail price even if wholesale prices fall to potentially pay off finance as early as possible THEN renewable generation can take advantage of it’s low marginal costs. Also the author fails to recognise that the Stadtwerke profits are able to subside other local public services that benefit the residents of the same geography. German consumers clearly understand this. This fixation on price and competition is comprehensively crippling low-carbon transitions around much of Europe, why try to hobble a shining example of renewable transition by advocating a switch to producers who rely on cheap coal? So it’s all the fault of these millions of stupid retail consumers not doing what they should do. I’m getting fed up of politicians, policy-makers, regulators and ‘experts’ sneering at consumers for failing to come up with a solution to the problems they have all created. The big vertically integrated suppliers are not passing on lower wholesale costs because they need to milk final consumers to repair their battered balance sheets. (The Stadtwerken, as Stephen Hall points out above, have their own incentives to milk their final consumers.) The politicians and policy have either been suborned by, or are afraid to take on, the big energy companies and can’t or won’t impose effective structural remedies. In the absence of widespread use of smart meters the energy companies can only really compete on price and methods of payment. (They may pretend otherwise by using all sorts of gimmicks, but it is still a pretence.) The last thing they want is a price war. So consumers will continue to be ripped off. And then it becomes their fault for being ripped off. The only blame they might carry is for continuously voting in the same stupid and greedy politicians who either created this mess or allowed it to happen. But, as we shall see throughut the EU after this weekend, many are no longer prepared to make this mistake again. “In order to enhance the overall economic eﬃciency, we argue that the ﬁnancial incentive for in-house PV electricity consumption should be abolished. This implies that either the consumption of self-produced electricity should be burdened with taxes, levies and other surcharges, as in the case of the consumption of grid-supplied electricity, or that the residential electricity price should be reduced to the ‘true’ costs of electricity procurement. Moreover, since grid costs are primarily ﬁxed costs, the traditional energy-related network tariﬀ should be replaced by a cost-reﬂective tariﬀ corresponding primarily to the grid connection capacity. As a result, competition between PV and all other electricity generation technologies would be ensured and ineﬃcient investments avoided. A German Transmission System Operator like Tennet pays 300-400 euros on average for every MWh of electricity produced with biogas or solar energy while getting 30-40 euros for it on the wholesale market. Wind costs are lower but still around 4-5 times higher than wholesale price. This cost is passed on to consumers. It is the difference between the guaranteed FIT payment for renewable electricity producers and wholesale price. Due to priority access to grid regardless of power price (FITs are paid whatever the power price), wind and solar push wholesale prices down and sometimes they have been negative. Lower wholesale prices increase FIT costs (difference between wholesale price and guaranteed FIT).